Work, Love, Pray is a hands-on guide for young professional Christian women seeking balance and fulfillment in all aspects of their lives. Full of practical advice and inspiring stories, this book helps sidestep the pitfalls of the 'Superwoman, ' while encouraging women to reach for the best of all three worlds: faith, family, and career. - Publisher The number of Christian women in today's professional workforce is increasing, and they are hungry for practical mentoring. They yearn to learn from someone who has climbed the ladder of success without sacrificing family or faith---something author Diane Paddison has done with excellence and grace. The stories Paddison shares about her corporate, personal, and spiritual life, as well as the lives of other women like her, are both inspiring and instructive, providing on-target advice and concrete examples of how to succeed without feeling overwhelmed or compromised. This is a working book for working women. Full of practical, proven guidance that is both professionally viable and biblically sound, each chapter includes sidebars featuring pertinent facts from current research, resources relevant to the chapter's topic, action-oriented 'to do' lists, and other interactive material. Chapters also include questions suitable for discussion, making it an excellent resource for use in small groups. Work, Love, Pray is a valuable resource for professional Christian women, but it's also a must read for the husbands, sisters, daughters, and friends who share their lives. The number of Christian women in today's professional workforce is increasing, and they are hungry for practical mentoring. They yearn to learn from someone who has climbed the ladder of success without sacrificing family or faith---something author Diane Paddison has done with excellence and grace. The stories Paddison shares about her corporate, personal, and spiritual life, as well as the lives of other women like her, are both inspiring and instructive, providing on-target advice and concrete examples of how to succeed without feeling overwhelmed or compromised. This is a working book for working women. Full of practical, proven guidance that is both professionally viable and biblically sound, each chapter includes sidebars featuring pertinent facts from current research, resources relevant to the chapter's topic, action-oriented 'to do' lists, and other interactive material. Chapters also include questions suitable for discussion, making it an excellent resource for use in small groups. Work, Love, Pray is a valuable resource for professional Christian women, but it's also a must read for the husbands, sisters, daughters, and friends who share their lives. Diane Paddison has held several executive positions for corporate companies, including Chief Operating Officer of Trammell Crow (now CB Richard Ellis) and ProLogis. She is currently the Chief Strategy Officer at the commercial real estate firm Cassidy Turley, and is also a board member for the business colleges of Oregon State University and Abilene Christian University. She and her husband have four children, and they live in Dallas. 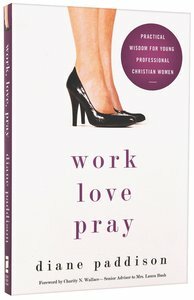 Customer Reviews For "Work, Love, Pray"
In Work Love Pray, Paddison draws on her experience as a senior executive to outline the problems that Christian women face in the workforce, and to suggest ways to maintain and grow as a Christian. She has a chatty and personable style which makes the book easy to read, and each chapter has real-life examples from Paddison’s own life, and from the lives of other Christian women in business. One of her main points is how few churches adequately cater for Christian professionals, especially professional women, as the church still has this (conscious or unconscious) expectation that women ‘only’ get tertiary education in order to get a ‘Mrs. Degree’. Readers are encouraged to use the talents God has given them, and challenged to grow spiritually through reading Christian books that make us think. This would be an excellent book for a young Christian woman starting her career. As someone a little older, I found the problems to be consistent with my own experience, and the advice and suggested solutions to be sound. However, I would recommend other titles for women with children (such as Women Who Do Too Much, by Patricia Sprinkle, which was quoted in Work Love Pray). Thanks to Zondervan and NetGalley for providing a free ebook for review.